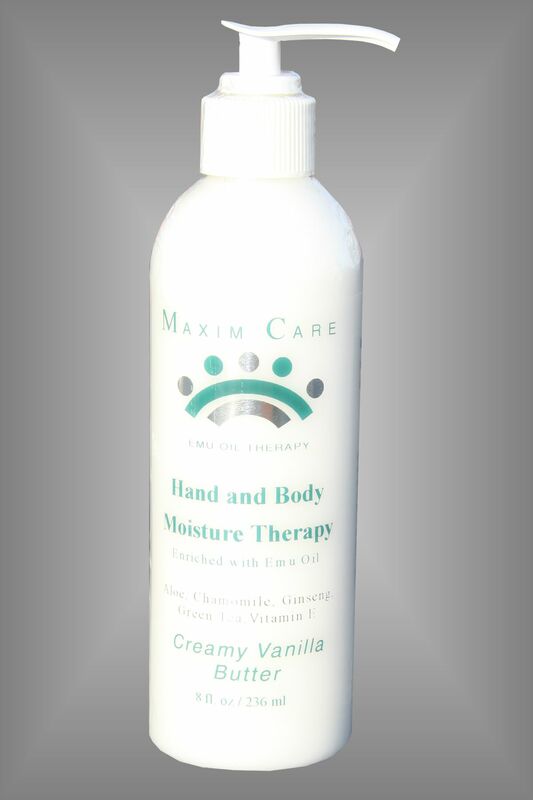 Maxim Care Hand and Body Moisture Therapy is our unique hand and body skin therapy formula that our customers keep coming back for more. Used by many customers for the uniqueness of staying on the hands even after washing makes this a number one choice for beauticians, nurses, dental personnel and others particularly in the healthcare field or other occupations who are constantly in water and/or washing their hands. Our lotions are made with the maximum amount of Emu Oil for the most beneficial results so they go to work fast! Most skin care products on the market evaporate quickly after applying, leaving a false impression of moisturizing your skin. Our Primary ingredient is Emu Oil, known for its unusual property to penetrate the skin with great efficiency. Our unique Emu oil hand moisturizer that soothes and softens dry, cracked fingers, rough, chapped and dry skin. Available in your choices of 2 fragrances: Creamy Vanilla Butter or our popular beach fragrance; Jamaican Me Crazy which is a tropical fragrance with a hint of Coconut. Provide your skin with a sumptuous daily treat and give it the moisture it craves! Directions: Apply topically two to three times a day, or as neede, to revitalize the skin and to replenish moisture loss. Chamomile Extract, Triethanolamine, Tocopherol Acetate (Vitamin E), Germaben IIE, Creamy Vanilla Butter fragrance.